It’s December! Which can only mean Father Christmas is on his way very soon, so if you haven’t already done so, it’s time to pull out the decorations and spread the festive cheer in your home. No stone should be left unturned and no part of the house should be left undecorated, which goes for the staircase, too. From covering your mopstick handrail in tinsel to creative patterns along your cladding, we have you covered to help you truly mark the most wonderful time of the year. A simple yet effective decoration, the Christmas stocking is every bit as traditional as the tree and turkey. If you have young children in your home, they will surely love having their very own stocking hung across the staircase. Of course, this does depend entirely on where your staircase is located in the home, but if your house is one of many designed with the staircase adjoining the living room, this will be absolutely perfect for you. Why not place a little something for the little ones to open up on Christmas Eve inside their stockings before the big day? Our mopstick handrails look incredible all year round, but with the added spice of festive cheer, they really do come to life. If you have overestimated the amount of tinsel needed to decorate the tree, your staircase is the next best place to use any decorations. Be careful not to go overboard with the tinsel, however, as just one strip along the handrail is enough to keep things festive yet refined. If your staircase makes use of wooden stair cladding, then you are able to make use of stickers up and down the steps. How this works is by placing stickers in order on the cladding facing forward (not what you would step on) so anyone looking directly at the staircase will see a fun Christmas graphic. Be sure to invest in stickers printed on adhesive backed vinyl, to avoid unnecessary damage to your staircase parts when removing post-Christmas. 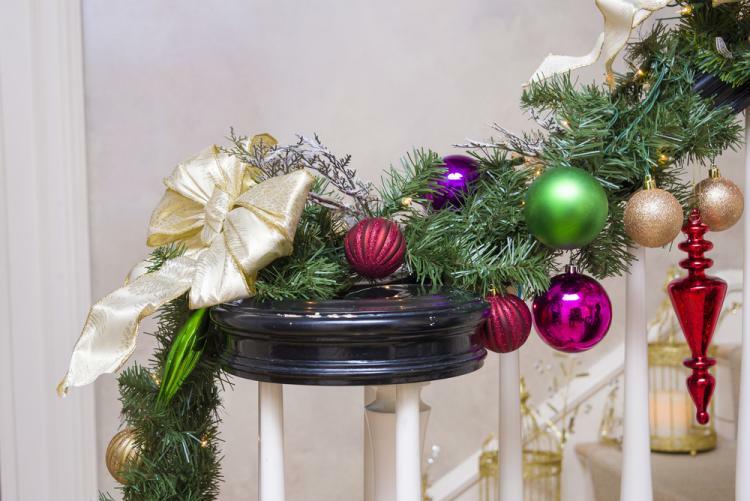 With your staircase and mopstick handrail covered in festive decorations, do not forget to liven up the connecting wall, too! Wall decorations do not have to cost the earth – in fact, you could ask any of the children in your home to make their own decorations for that invaluable personal touch. Equally, pictures of Christmases gone by would also make for a fantastic addition, turning your staircase into a trip up and down memory lane. What fun would it be if you didn’t incorporate a set of lights into your staircase decorations? None at all! There are a couple of different ways in which you can use lights on your set of stairs – either by wrapping around your mopstick handrail or weaving in and out of your spindles to create a luminous effect in the dark. However you decide to decorate your staircase this Christmas, remember that Blueprint Joinery offers a range of features to keep your home looking immaculate all year round. For more information, please call our team today on 01691 671020.